Coming from a $20 set of clubs this set totally changed my golf life. Easy to hit and easy on the pocket book. I expect some of the distance on these comes from the stronger lofts. I of course wouldn't have rated them low just because the place I bought them screwed up...so Tony...go blow a goat. If you are a just starting out and you can still find them these are great irons for high to mid handicap. 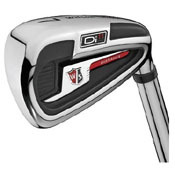 If you have already been through a couple of higher end sets you would get the high end WS irons. Very nice looking irons. From address position, they don't even look like the game improvement irons they're advertised to be. Great feel, even on off-center hits. Distance is fantastic, but at a cost. Because of the stronger lofts, it is difficult to hold some greens. If you've ever played Pings, you're used to a much different ball flight and action on the green. TERRIBLE experience with Wilson and Golfsmith, who I bought them through. The graphite shaft of my eight iron broke during a round. Returned it to GS over a month ago. They lost my club and now have stopped communicating with me altogether. Wilson could not, or would not help. Never buy anything from Golfsmith. I'd sell my Wilson's but I don't have an eight iron. Going back to Pings as soon as possible.